The bane of Titanium developers everywhere, this nasty little message comes up when you launch your app from the post-install dialog. While it’s all harmless, and doesn’t actually indicate that your app has crashed, it sounds an awful lot like a crash alert. Not a nice way for a user to get a good first impression of your app. I hope in the near term this will be a default behavior for all Titanium-built android apps. Even though the fix is perfectly good, it’s not immediately obvious to new developers, so they may struggle unnecessarily with this issue. 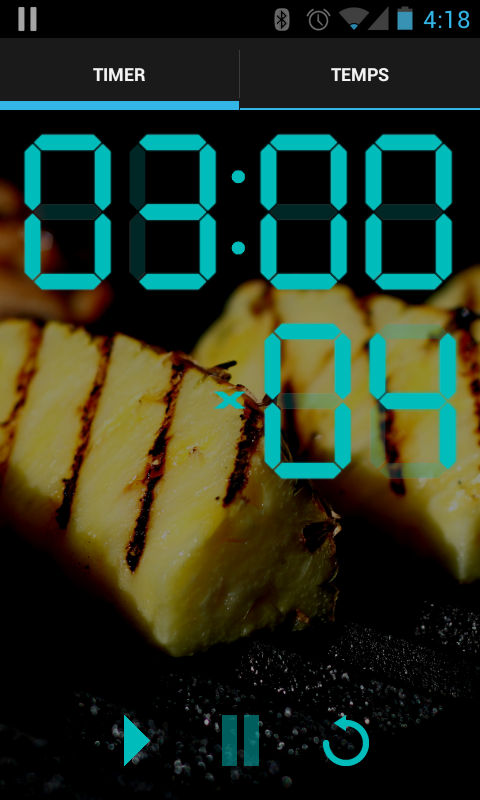 While GrillTime is a simple app, it ships with a lot of heavy graphics, due to the photography I selected for the backgrounds. So it would be nice for the user to be able to install the app onto an external storage card if his device has one. 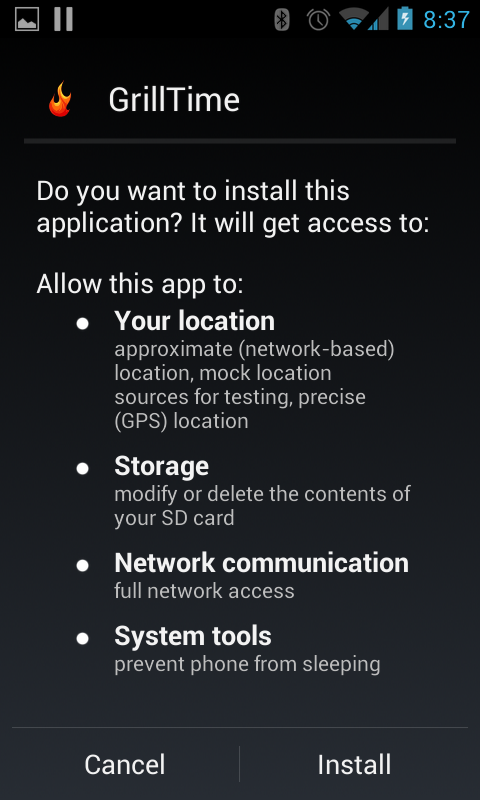 By default, your manifest will not specify anything for android:installLocation. According to the android documentation, not specifying anything for android:installLocation will limit the app to installation on internal storage. Specifying “auto” will allow the user to move the app to external storage if he wishes to do so. I really like the look of the android 4 UI. 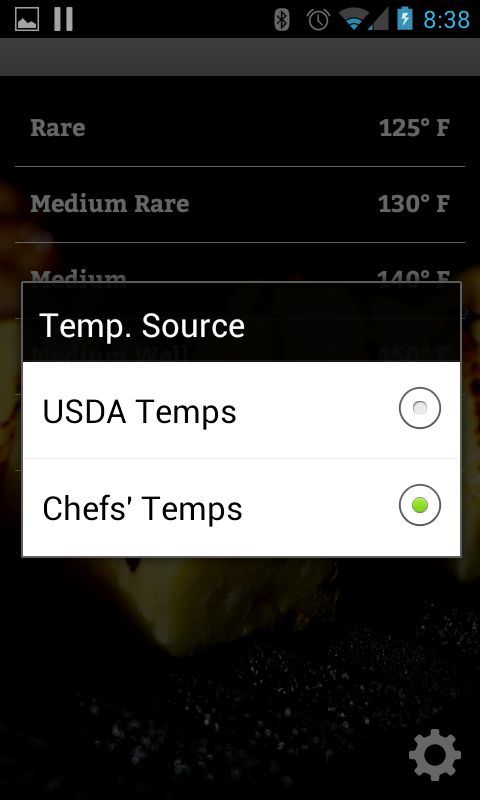 I thought it would be nice to allow my app to use that UI style when it is running on android 4. Unfortunately, I found that with the Holo look and feel, my tab icons were gone. This is a known issue in Titanium. So I ended up removing the targetSdkVersion. 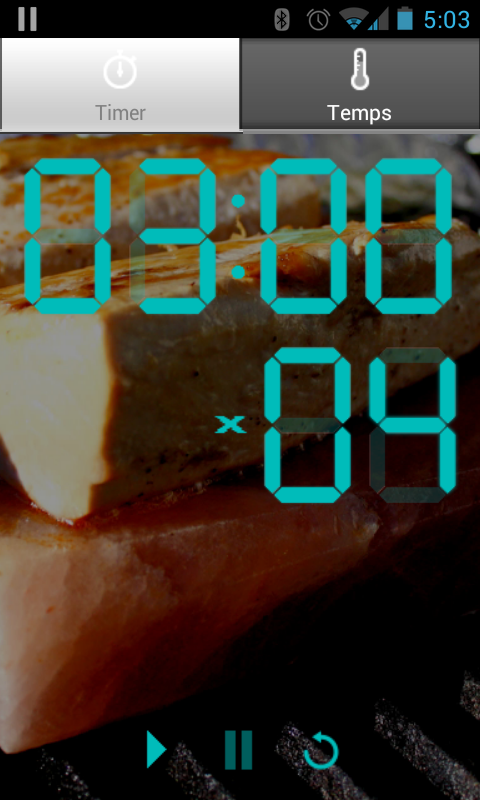 Since there’s no good reason that a grill timer would need to know the user’s location or use the network, this could cause a user to mistrust the app. It is best to reduce the requested permissions to the bare minimum required by the app. At first, I suspected that the permissions were due to the fact that analytics are enabled by default. However, disabling analytics did not change anything. 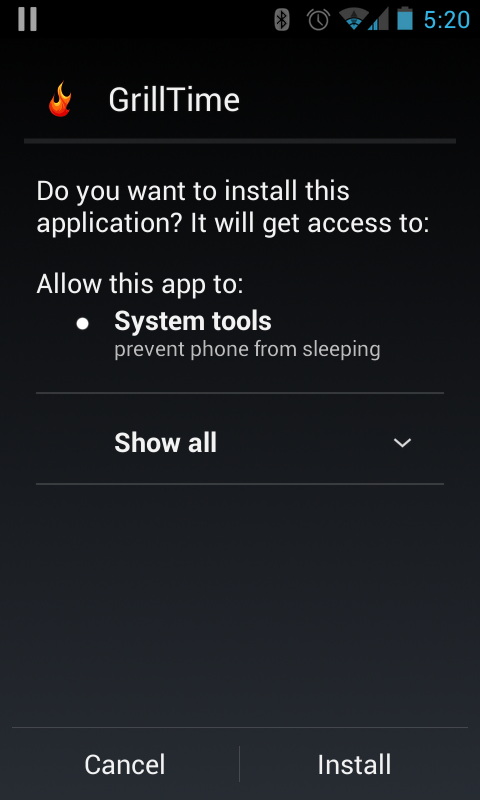 The app installer was still asking for all of those permissions. I discovered that you have to use a custom AndroidManifest.xml. This is not the most convenient thing to do, but it’s not hard to set up. Build your app once for android, then grab the resulting AndroidManifest.xml from PROJECTDIR/build/android and put it in PROJECTDIR/platform/android (create the folder if it doesn’t already exist). (note that Titanium inserts most of these by default in every app; I added VIBRATE and WAKE_LOCK explicitly in the tiapp.xml because my app needs them). As long as I was cleaning up the app, I figured I might as well update to the latest Titanium SDK. So I updated to 3.0.0. I didn’t know this until later, but 3.0.0 made major changes to TabGroups — they are now part of an Action Bar. Support for the Action Bar is very exciting in its own right, but my app doesn’t really need an Action Bar, and I couldn’t figure out how to minimize it. So it left a little “title bar” area above my tabs that serves no function. It wasn’t too bad in the pre-Holo look and feel, but it looked even worse with a Holo theme. See below for a full rundown of all the TabGroup look-and-feel variations. I ended up reverting to 2.1.4 to avoid having the useless little title bar up top on android builds. I went down a crazy rabbit hole with the TabGroup and the Action Bar. My first step was to change to Titanium SDK 3.0.0, which unbeknownst to me introduced a major change to the TabGroup; the TabGroup is now paired with an Action Bar. This is an exciting change, but not important to this app. 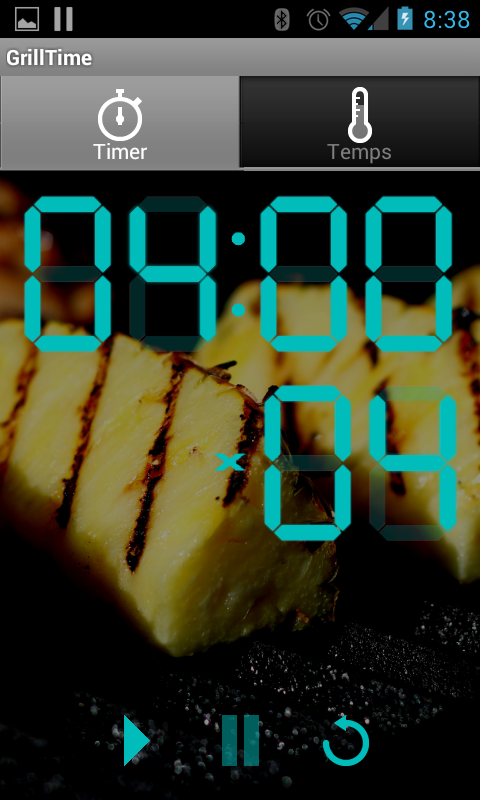 For GrillTime, it has the net effect of putting a small “title bar” at the top of the screen. I didn’t notice that right away. 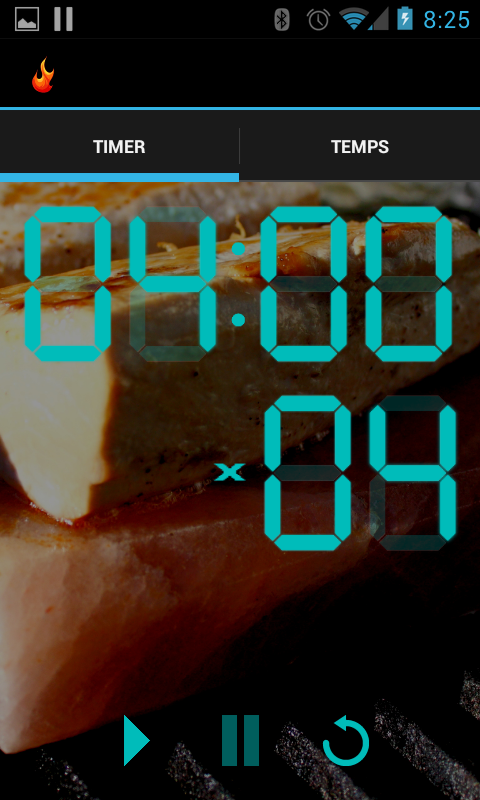 I then set the target android SDK to 11 to access the Holo look. I saw right away that the icons on the tabs were gone. But I left the SDK setting in place for the time being anyway. I then worked on the permissions issue, which required that I put a custom AndroidManifest.xml file in platform/android. So far, so good. After taking a close look at the tabs, I noticed the Action Bar (well, I didn’t know what it *was*, but I didn’t want it there). I also decided that the Holo look wasn’t worth losing the icons. I thought that the Action Bar came with my target android SDK choice. I didn’t realize it came from my choice to use Titanium SDK 3.0.0. By removing it entirely, I probably had no minimum SDK version at all. Then I got a really weird effect on my tabs, where they looked more or less like the old look, but they were really light colored, which made them hard to read. I finally started to piece it all together, and I took a series of screenshots to document all the various combinations of Titanium SDK and minimum android SDK settings. Notice the really bright, hard-to-read tabs. At this point, our app is ready to publish in the iTunes app store or the google play store. 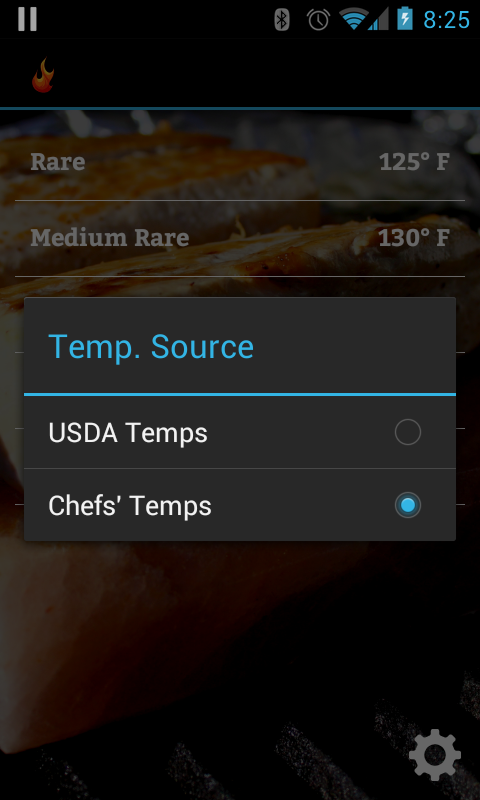 I may eventually publish it in the google play store just for fun. I probably won’t spend $99 to put it in the iTunes store, though. I hope you’ve found this tutorial informative, and that maybe it helps you deal with some of the nuances of building cross-platform apps with Titanium.